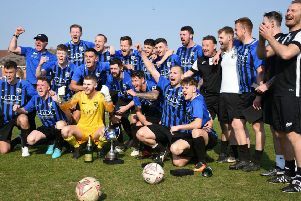 It has been a memorable week for Sherwood Colliery in the Abacus Lighting Central Midlands League. On Wednesday evening they claimed an impressive scalp in the Notts FA Senior Cup at AFC Mansfield. The host club took a ninth minute lead, Sherwood equalising through Cliff Clarke three minutes before half-time. Despite many close calls at both ends the match went into extra time, Julian Topliss scoring the decisive goal. The previous night saw the first game under the new floodlights at Debdale Park, the club’s reserve side beating Harworth Colliery 2-1 in the YourFootballWorld.com reserve division. Jordan Simpson and Eden Homer’s goals proved enough, Connor Brown getting one back for Harworth. Pinxton carry the Central Midlands League flag into round three of the Derbyshire FA Senior Cup. Luke Walker gave them the lead against Swanwick Pentrich Road, but the home side found themselves behind at the break as Dean Owen and Ian Milson scored for the Swans. Walker struck again to send the game into extra time, Pinxton lasting the pace better as Walker completed his hat trick and Glen Fidler, Jimmy Adcock and Chris Shelton rounded off a 6-2 win. The other three teams bowed out of the competition. Belper United came closest but were beaten 3-2 at home by Heanor Town. After going two behind, Adam Robley pulled a goal back for Belper before Heanor struck a third. Ben Stockley reduced the arrears again but the home side couldn’t force an equaliser. Despite a heroic display by their keeper who saved two penalties, Holbrook St Michaels went down to 3-1 defeat at Long Eaton United, Fenwick Butcher scoring from the spot for Holbrook’s goal. Mickleover RBL also tasted defeat, losing 2-0 at Stapenhill. Two CML teams progressed in the Notts FA Intermediate Cup. Radford reserves beat Netherfield Albion thanks to a Dominik Walkus goal, while Hucknall Town reserves avenged their first team’s weekend defeat by Linby Colliery, beating Linby’s reserves 2-1, the scorers Toby Birch and Jarrod Davies.